Our vision is to be the best hotel Wexford, Ireland, has to offer. 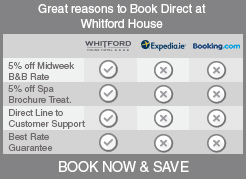 Our team wants to build on the success and reputation of Whitford House Hotel, creating a warm environment where guests and staff feel at home in opulent surroundings. Our mission is to always treat guests with the utmost care, our staff with respect, and that our business will always be instigated by passion. Our core values show commitment to the team, ensuring the best hotel rooms and facilities possible and being fully responsive to the needs of the customer. We wish you the very best of what Wexford has to offer, your enjoyment is fundamental to the pleasure we derive from the hospitality business.